WHEN IS THE RODEO? Our Rodeo is always during the 3-day Presidents’ Weekend in February. In 2019, the dates are Saturday, Sunday and Monday, February 16, 17 and 18, 2019. WHAT TIME DOES EACH DAY START? The Rodeo is at Noon on Saturday, 11am on Sunday and Monday. WHEN DOES COWBOY CHURCH START? WHO CAN ATTEND? Cowboy Church starts at 9am on Sunday and all are invited to attend. HOW WILL I KNOW WHAT EVENT IS COMING UP? Each day will have a “Daily Sheet” that will list all the events for that day and the Rodeo Announcer will keep you well informed as the ‘Shows Goes On’. IS THERE AN ENTRY PARADE? At the Rodeo, there is an Entry Parade featuring flags, our Rodeo Queens and the prior year’s winners. HOW DO I PARTICIPATE IN THE RODEO? Please check our PARTICIPATE TAB, which lists all the ways actual contestants, volunteers and even audience members can participate. IS THERE PARKING? There is parking on the asphalt parking lot and additional parking on the grass surrounding the arena. There are also some ‘handicap’ parking stalls. DO I BUY A TICKET FOR EACH DAY? One ticket may be used on any of the three days. A 3-Day PASS for only $25 will cover all three days. WHAT IF IT RAINS? Be sure to get to the Rodeo early and score a seat under the covered bleachers. The Rodeo will go on, whether or not it is raining. WILL MY KIDS ENJOY THE RODEO? Absolutely! The Rodeo is a great Family-Friendly event and we have our young cowpokes participating with “Junior Rodeo” events like riding a sheep. Lots of fun. I DON’T KNOW MUCH ABOUT RODEO, HOW WILL I UNDERSTAND WHAT IS GOING ON? 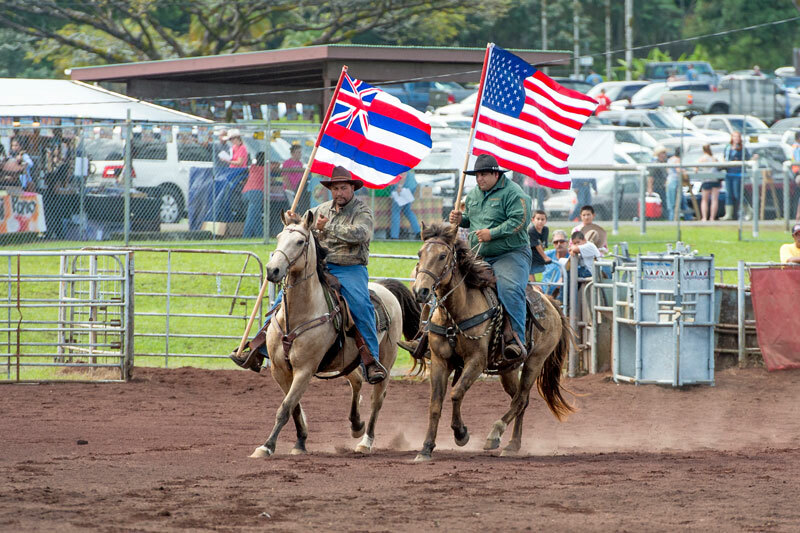 Our Rodeo Program and Professional Announcer, Justin McKee, will both entertain and inform you about all our events… especially the ones that are “Hawaii-only” ones, based on the early needs of our paniolo to rangle wild cows out of the jungle. WHO PUTS ON THIS RODEO? 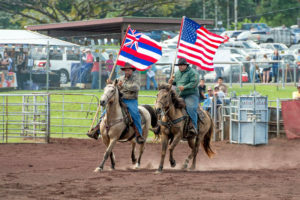 The Pana’ewa Stampede Rodeo is put on by the Hawaii Horse Owners, Inc and has been available to our enthusiastic audiences since 1993.